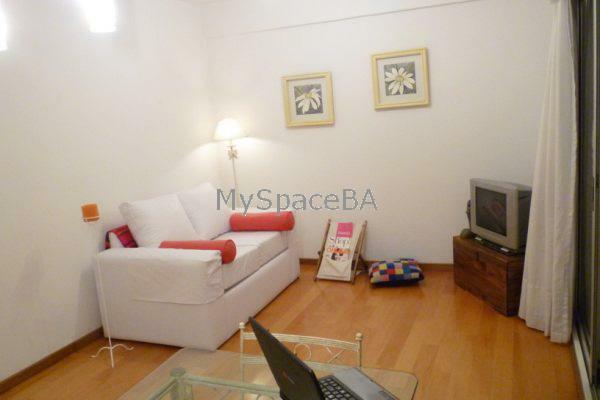 Nice, bright and very quiet one bedroom apartment exceptionally located in Palermo Hollywood. The apartment has a living room with lovely balcony, a comfortable sofa bed, a glass dinning table with 4 chairs, TV and a wooden floor. The bedroom has a double bed. It has a complete bathroom with bathtub and shower and a fully equipped kitchen. Balcony with an excellent view. Wooden floors, cable TV and internet high speed. Wi Fi . Landline telephone. Washing and dryer machine. Fully equipped kitchen with microwave, fridge, freezer, coffee maker, toaster and a gas oven. Towels and bed linen. The building is brand new and offers a swimming pool for summer season, solarium and a barbeque area. Two elevators. Included: Electricity, gas, water, telephone for local calls, building and city taxes.